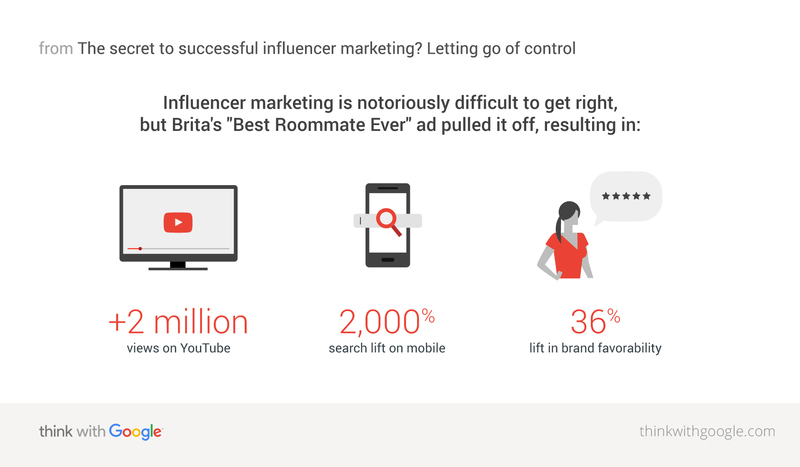 Influencer marketing is notoriously difficult to get right, but Clorox brand Brita managed to pull it off in its latest campaign. Kate Stanford, director of YouTube ads marketing, spoke to the team behind the ad to learn more. Marketers have always loved celebrity endorsements, and who can blame them? Research shows these partnerships are good for both brand lift and sales. But consumer behavior is changing, especially among younger generations. Today, millennials are just as likely to seek style tips from a fashion vlogger like Zoella as they are from a more traditional celebrity like Victoria Beckham. Innovative and effective marketing campaigns recognize this shift and work it to their advantage. That’s exactly what Clorox brand Brita did this year when it paired up NBA superstar Steph Curry with YouTube creator and social influencer King Bach. The result of this unlikely collaboration? A hilarious made-for-YouTube ad that generated over 2 million views and led to a 2,000% mobile search lift. I spoke with David Kargas, a director of marketing communications at Clorox, and Kai Hasson, creative director at Portal A, the digital studio behind the ad, to find out more. Kate Stanford, Google: Let’s start with some context for those who haven’t seen the ad. What was the thinking behind it and what were you trying to achieve? David Kargas, Clorox: We’re always carrying out social listening to learn more about our customers, and one thing we noticed was that people would regularly complain about a roommate or partner who drank the last of the water in the Brita and didn’t refill it. Refilling an empty Brita used to take a few minutes, but our new product, Brita Stream, filters as you pour, so it eliminates the waiting. The aim of the ad was to increase awareness of this product, specifically among urban millennials. We wanted to do it in a fun, playful way using a story that our target audience would relate to. So we took that annoying roommate scenario we’d heard them talk about on social media and used that as the starting point for the ad. Steph Curry has been Brita’s brand ambassador for almost two years. What made you decide to pair him up with social influencer King Bach? Kargas: In the past, we’d always used Stephen in the “traditional” advertising spokesperson way: we’d come up with a script for a 30-second TV spot in which he’d endorse our brand. But this time we were particularly interested in targeting millennials. Given what we know about their consumption habits—research suggests they’re turning more and more to streaming services like Netflix, and online video platforms like YouTube—we decided to experiment with made-for-YouTube content. It didn’t make sense to try and apply the rules of TV to YouTube, so we went all in and teamed Stephen up with a YouTube creator. What millennials want from brands is an authentic voice. When it comes to influencer marketing, how are the rules of online platforms like YouTube different from TV? Kargas: When we work on a TV spot, we pretty much control the entire creative development process, from writing to directing to editing. This campaign was completely different. From the get-go, we decided we wouldn’t be creating, writing, or art directing. It would all be left up to King Bach. The main theme we kept in mind was the importance of letting go of control. That ensured we were creating compelling content that resonated with Bach's audience. Kai Hasson, Portal A: Traditionally, marketers tend to take a more heavy-handed approach to messaging. But what millennials want from brands is an authentic voice—content that comes across as genuine and fresh. The best way of achieving this is to loosen the reins on your typical process, and trust your team to create entertainment that can break through the online noise. Everyone involved should know two things: your objective and your boundaries. Everything else is creative space. It takes a big leap of faith for a brand to hand over so much creative control. What advice do you have for other companies looking to do something similar? Kargas: The first thing you must do is make sure you’re working with a creator that’s right for your brand. Portal A drew up an initial list of around 40 different YouTube creators, based on their popularity among our target audience. We then narrowed that down and took a short-list to Stephen. If we were going to pull off the ad’s “roommate” concept in a genuine way, we had to make sure there would be the right chemistry between him and the creator we chose. That being said, it’s really important to be clear from day one about your expectations. Everyone involved should know two things: your objective and your boundaries. Everything else is creative space. Remember, you’re working with creators because they have demonstrated a skill, so you have to stand back and let them do their thing. It pays off. How exactly have you seen it pay off? Hasson: From a creative perspective, the collaboration paid off because it helped elevate the overall concept in a way we couldn't have done ourselves. For example, Stephen and his team were weighing in at key points in the creative process, which helped us play to his strengths and add some personal touches. That’s how we ended up including references to his trademark shoulder shimmy. When you give celebrities and creators the opportunity to collaborate and contribute to the process, the audience will sense that authenticity. Kargas: It also paid off in terms of broader business goals. So far we’re at over 2 million views on YouTube, which helped drive a 2,000% search lift on mobile and a 36% lift in brand favorability, and we made it to the March 2017 YouTube Ads Leaderboard. We also got great press coverage from publications like ESPN, DailyMotion, Yahoo Sports, and TubeFilter. In terms of earned media, not only were people sharing our video at an incredible rate, but they really related to the roommate story. People would leave comments along the lines of, “Hey, Gary, does this remind you of anyone?” We loved that. When you see your target audience really engaging with your content in this way, you know you’ve hit the mark. How Can Brands Win Dads’ Loyalty on YouTube?